About four years ago we decided to install a big ole' swimming pool in our backyard and we have never, ever regretted it. Not once! 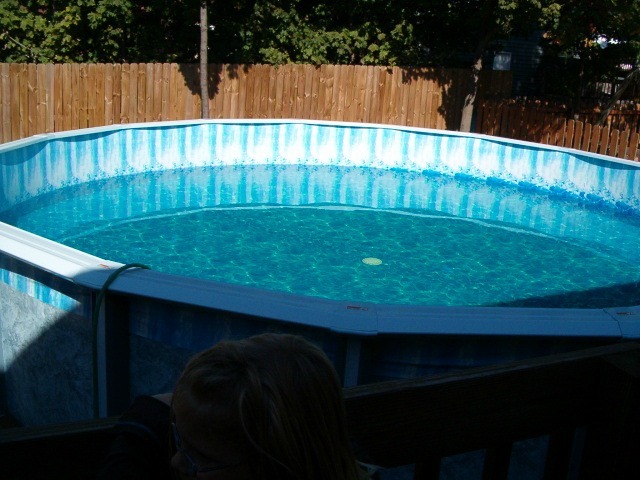 We started off with an Intex Pool with the big blow up ring around the top and fell in love with the whole pool idea. We used it all of the time, but quickly outgrew it. Then I had an idea to buy a bigger pool and make it a permanent fixture(well technically it can be moved). Hubby wasn't exactly on board so I had some convincing to do, but it was an easy sell. We knew an in ground pool was out of the question. Plus, we do live in the Midwest and we really only get about 4 good months of swimming weather. So we shopped around and ended up with a 24' round Doughboy above ground pool. It's 4 foot deep around the edges of the pool and the center has a gradual descent to over 5 foot deep. 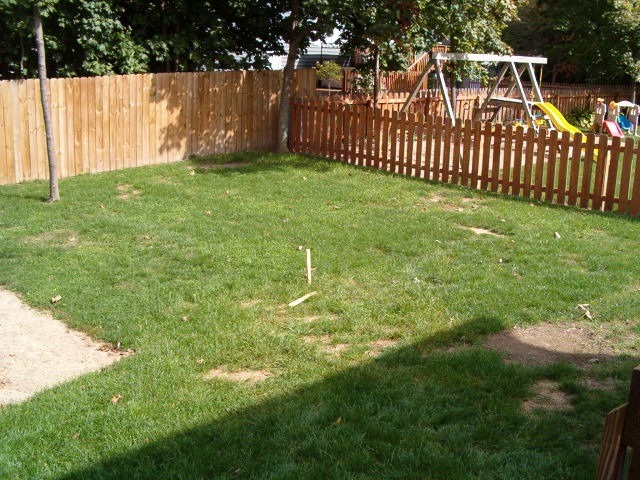 We thought as the kids grow it would give more depth for everyone. Plus we put in a center drain and it helps keep the water cleaner. I don't have to vacuum very often because the drain catches all the debris. I'm loving it! could use the space. Another great idea! After several days of excavating the ground and putting the pool together it was finally done. the sun zaps the chlorine...just a little pool chemistry talk. Yawn, boring! 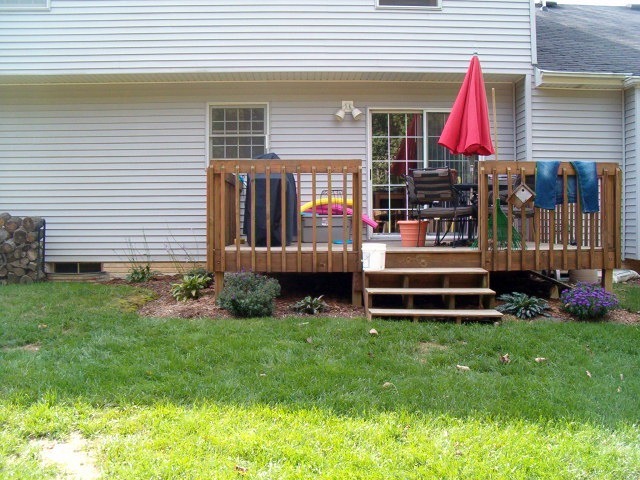 After the pool was installed, I was insistent on getting the pool deck built onto the existing deck. It was going to make getting in and out of the pool so much easier plus life guarding the kids easier too. Our family and friends all came together to help build the deck and install the electricity. They all are so handy that it only took them a day to get it all done. Here are some pictures of the process with the girls helping out a little bit. I'll be back with some current pictures of how it looks today all finished and prettied up. That looks like a piece of heaven, right there, Andrea! There is nothing better than floating the afternoon away with a pool noodle draped around you! I am soooo jealous- but I think I have as much of a chance of convincing my husband to get a pool as you do of convincing yours to paint your cupboards! lol... I'm going to keep trying though- I can't wait to show him your post! Oh, I'm so jealous! I wish we could have an above-ground pool. Our homeowners assoc. only permits in-ground pools and those are way too expensive! I can't wait to see the final result! I'm jealous! Especially since it's going to get very hot here this week. Enjoy it! The pool is awesome! Wish we could justify it here in Portland :) Can't wait to see the deck! It is so wonderful to have your own swimming pool at home. However, maintaining it should be done regularly. It's great that pool parts are now available to purchase over the internet.